Lovers, on the left plant your pretty peepers on Pierre Hardy’s Laser-Cut Slingback Booties – the very same ones seen upon Blake Lively (as Serena van der Woodsen) on Gossip Girl; to the right acquaint yourself with Chinese Laundry’s haute-to-trot Hopscotch, if you will. While the color of the chic Chinese Laundry’s is ever so slightly darker than that of the Hardy originals; for just $119.00, as opposed to the $1,000.00 required to skip home in the Hardy’s, they are every bit as perfect for adding a dash of playful to your shoe collection – at a price that would leave Ms. van der Woodsen herself green with envy! Erika - you never cease to amaze! What a great find! I like the higher heel of the Hardy but the price of the CL. However, my funds are being thrust into the StyleNation Las Vegas Meetup piggybank!! I always have a hard time splurging. I don't think I ever have... I've always gone for the less expensive. I'm just cheap, I guess! 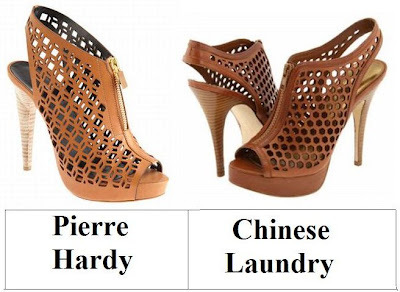 The Chinese Laundry shoes are definitely a great option; I can't imagine spending $1,000 on a single pair of shoes! The Hardy's look better made for sure. I love the wooden heels on these shoes! Your budget finds for high end items never cease to amaze me. I definitely like the way the Pierre Hardy ones look! chinese laundry for me this go around. Love this series so, and this is one of my favorite side-by-sides yet! They look almost identical! I would definitely go for the Chinese Laundry pair... the darker shade is more appealing and at that price difference, how could you say no?? loving the chinese laundry!! soooo cute!! oooooo 1000 $$$ for shoes.. .. idk if it will happen in my life time. haha. The Chinese Laundry shoes are perfection. I love how they are budget friendly too, they would have to be my pick this time. Absolutely love the booties! I have such a shoe fetish!! those shoes are hottt!! and what a great find (for the cheap one)!! These are fierce! I'd definitely go for the Pierre Hardy pair... if I were swimming in cash, that is. Love Chinese Laundry! In this case I would go for whatever is more comfy. I could imagine myself wearing either one in an awesome dress. Hi, I love your blog and state the following and I and decided to open a new one, hope you like it. I love these! They remind me a bit of the Pradas I've been drooling over... What a fantastic match! All I can think about are snow boots right now..and furry slippers when I'm not in them..
i'd definitely go for the chinese laundry ones, what a great find! This an amazing find. So cool that you found these at that kind of cool price. Chinese laundry definitely for me!!! I always love Serena van der Woodsen and Blake Lively's styles, and I love these shoes too! Once again, another post, another triumph. You are GIFTED, Girly. Keep em comin. E, you should definitely become a personal shopper because only someone like you would know how to find the best stuff. As for me, I like the darker color and the affordable price of the Chinese Laundry booties. Have a good Tuesday, E.
How do you do it! A great find. I need to bring you shopping with me. I feel like you could find me a less expensive identical version of just about anything! I typically am in love with Chinese Laundry, and this is no exception. I'm tightwad all the way today! I have a similar pair of shoes, which I love! I adore the Pierre Hardy ones. The squareish holes look so good. both are quite similar but i like pierre hardy design more. I think the CL pair are perfectly cute! The last pair of Chinese Laundry shoes I had gave me serious blisters. I love the Chinese Laundry ones- so gorgeous. I would love to wear these with an white eyelet fitted knee sundress in the summer. vavoom! Eva mendes eat your heart out! i love the pair from Chinese Laundry. they make great shoes! I like the color on the Chinese Laundry pair better. I like the Hardy's. The intricate design is amazing. What a fun shoe, too bad we have so much snow in Ohio. Chinese Laundry please! So adorable. I like the darker color of the Chinese Laundry shoes. Great find, indeed these two are just slightly, and such a huge price difference! on this occasion i vote for the pierre hardys... the chinese laundry ones are pretty but they never last long... hence the cheaper price... ha! I'd go with the Chinese Laundry ones! The shape of the cutouts is cuter, in my opinion.